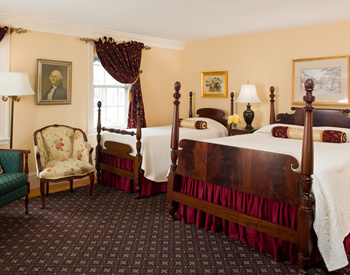 As the first lodging built in downtown Portsmouth in 1978, there is a distinct difference when you stay at Martin Hill Inn versus the modern hotels in town. 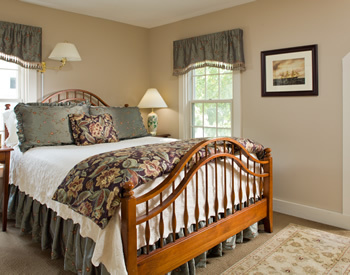 We invite you to settle into one of our uniquely decorated rooms while enjoying our seacoast town and the surrounding area. From your room, you can walk to downtown Market Square in just 10-15 minutes, and you can walk to the river waterfront in 20 minutes. 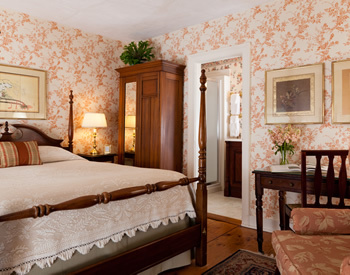 Both buildings that comprise the Martin Hill Inn represent typical New England architectural styles. The Main house is in the Greek Revival style while the Guest House is known locally as a Gable-entry New Englander. 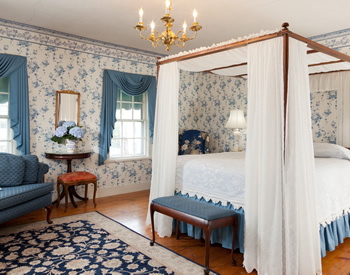 Both are modest in size and appointments, but they are decorated for comfort in styles that reflect the long history of the area, creating an ambiance that sets them apart from typical chain hotels. Room Amenities are listed below and to further assist you in choosing your room, visit this blog post for answers to many popular questions about our rooms. The stairs leading to the second floor rooms, especially in the Guest House, are fairly steep. For guests who have trouble with stairs, we suggest booking a room on the first floor. 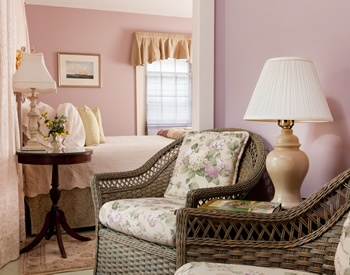 Each of our rooms is individually decorated and has its own atmosphere for you to enjoy. So that your stay is comfortable, all our rooms include the amenities listed below. Please note, we can only accommodate two people per room (even Ranger). You can check online availability and room rates and make reservation requests through the link below. Or, call us at (603) 436-2287. Deposits can be made with MasterCard, Visa, Discover, or personal checks. We also accept Portsmouth a la Carte Gift Cards. Sorry, we do not participate in the Bed & Breakfast.com gift certificate program. 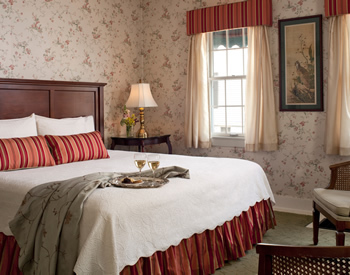 Room rates include a full breakfast served from 8:30 am to 9:30 am each morning. Rates do not include state tax and housekeeping gratuity. 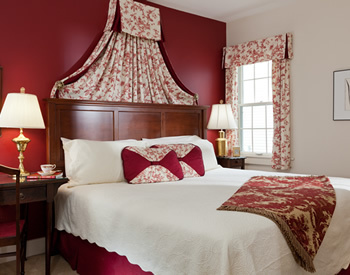 Two-night minimum stays apply for weekends (Friday and Saturday) from Memorial Day thru Columbus Day. Rates are subject to change. Gratuity: In the U.S., a gratuity for the housekeeping staff is traditional.